Every morning my mother drove me to a school out of district so that I could get a great education. Nestled in an affluent neighborhood, it was known as the only private-public school in town. Coming home from my first day of kindergarten, I asked her why my shirt didn’t have an alligator on the pocket. She immediately took me to Gayfer’s Department Store and bought me two Izod shirts – one pink and one white. We didn’t have a house in the popular zip code, a membership to a swim club, or a traditional family, but a shirt was an easy way to blend in. The other mothers, most of whom stayed home, wore pink and green button downs from Talbots, drove station wagons, and always seemed to show up for class parties with homemade baked goods. My mom taught school, wore jeans, drove a Honda, and knew every restaurant in town where kids ate free. But these women embraced her. In the carpool line, they intervened when she started to gray prematurely. They supported her rise to PTA president. They even took her to the Clinique beauty counter to buy a lipstick and a blush. Every morning she would run the brush over the powder once (and just once), then apply a stroke to each cheek. That blush lasted 20 years. When I was eight my mother went to have her colors done. It was what you did if you were a Southern woman in the 80’s. Not that my mother really cared about her colors. Or fashion. Or makeup. But there she sat in the living room of a friend while she was draped in color swatches. It was determined that she was a winter and should wear silver, not gold. They talked the way women do when they think no one is listening. And that’s when I heard the best advice ever. And now I’m going to share it with you. A woman should always decorate her home in her colors. 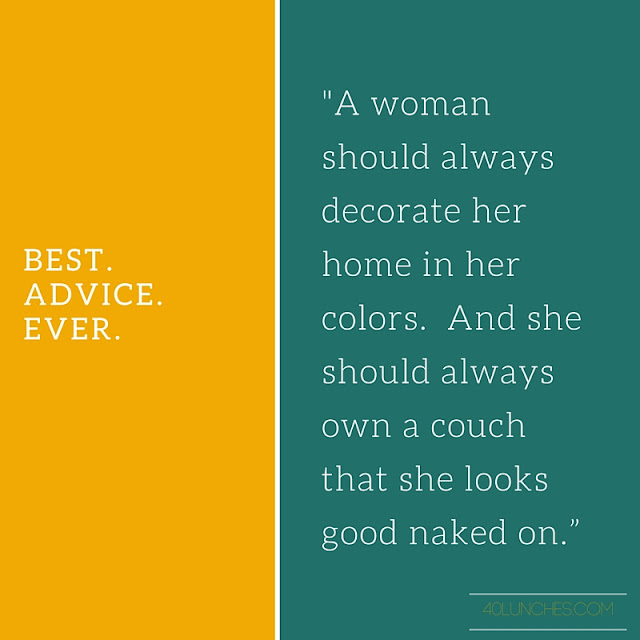 And she should always own a couch that she looks good naked on. When I bought my first house I furnished it with a lovely turquoise couch. For all of the advice your mother didn't give you, check out the awesome ladies at Stuff Mom Never Told You. Friend 40 Lunches on Facebook! Follow 40 Lunches on Twitter Pin it on Pinterest. Or share this post with a friend. Thank you! Ha! 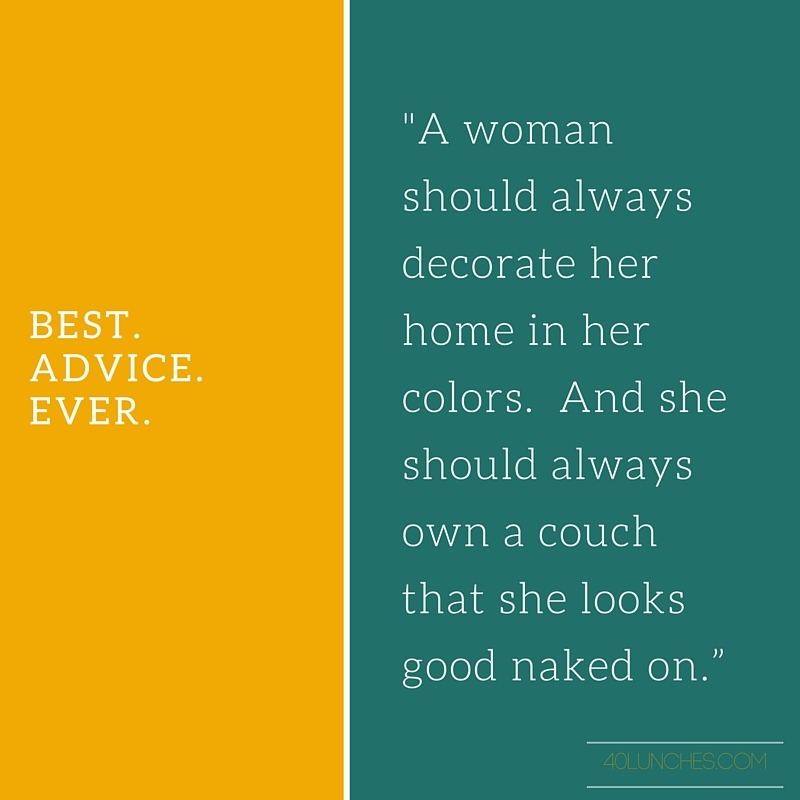 Love the couch advice. It has forever changed the way I look at a living room when I walk into someone's house! No one looks good naked on plaid! Love this! I want to hear more!! Thank you for reading! More to come! Sounds like a good reason to buy a new one!